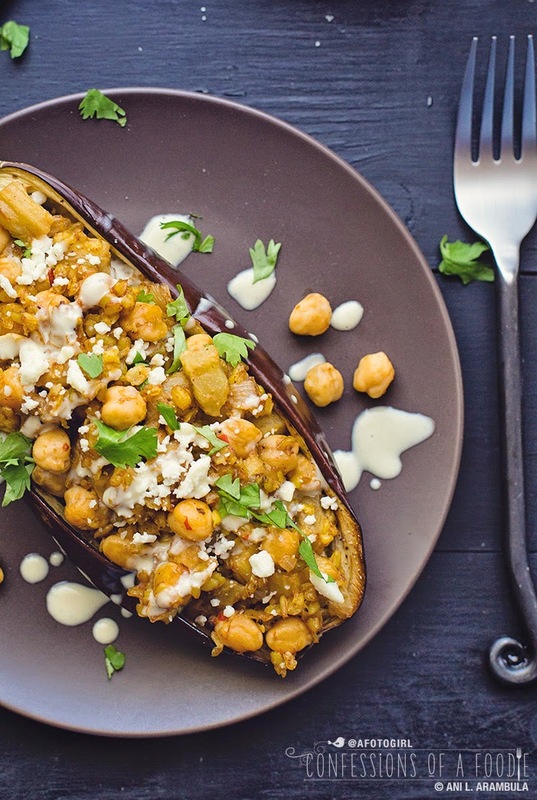 This vegetarian dish of chickpea stuffed eggplant is perfect for Meatless Mondays. 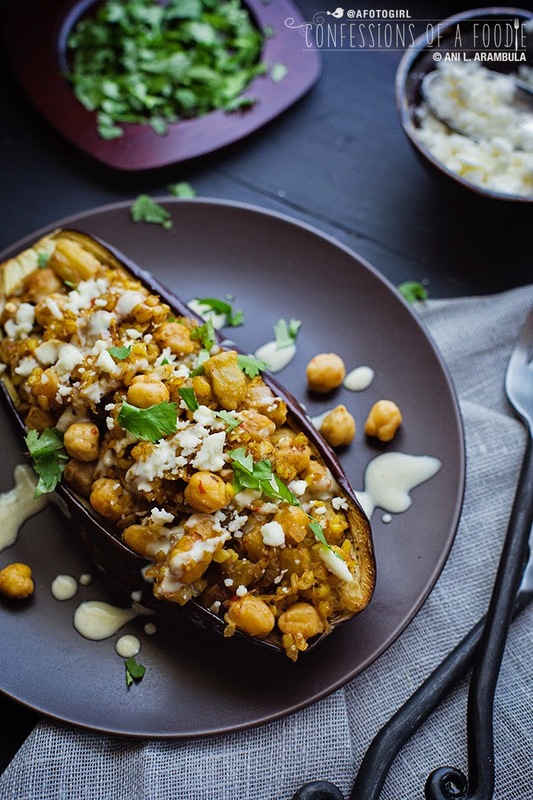 The roasting sweetens the flesh of the eggplant while Harissa paste, chickpeas, feta, and cilantro give this a global flair. This vegetarian dish is perfect for Meatless Mondays. The roasting sweetens the flesh of the eggplant while Harissa paste, chickpeas and cilantro give this a global, Moroccan flair. Typically referred to as a vegetable, eggplant is a fruit, more specifically, a berry. However, it is cooked as a vegetable and develops a rich, rather complex flavor especially with roasting. Eggplant never made an appearance in my house while I was growing up. I didn't try it until I moved away for college. I think I've mentioned before that it was my childhood best friend's older sister who introduced me to many new food experiences while I was away at school. I was attending art school in Oakland and she lived in San Francisco. Come weekends, Melba, and sometimes her then boyfriend (hubby now), would whisk me away from dorm life to experience new sights, sounds and tastes of some of the cultures in and around the San Francisco Bay area. I am indebted to them for helping to open up my world. 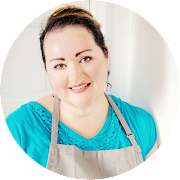 Although the food I grew up with is my go-to comfort food, my tastebuds nonetheless often have me seeking out the foods they introduced me to: Greek, Persian, Indian, Thai, African, Cuban. Whether the slim Japanese eggplants or the more familiar bulbous pear-shaped variety, eggplant has become a favorite to cook at home. 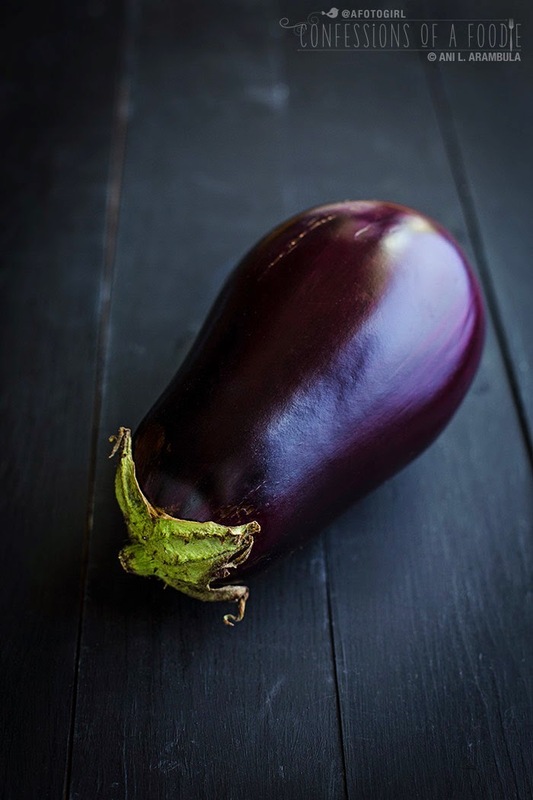 From my version of baba ghanoush (think, hummus but with eggplants), to my simple eggplant steaks, eggplant parmesan or imbottiti, and whether I'm making the Greek version of moussaka or the Turkish, I simply love eggplant's ability to soak up whatever flavors you cook it with, creating a different experience with each preparation. Simply roasting with a good quality olive and generous pinches of salt and pepper is by far my favorite way of quickly preparing eggplant. Stuffing it with leftover bulgur wheat and some chickpeas for some protein elevated this to an entree. Added bonus: this meal can be very budget-friendly. The day I picked up this eggplant, Sprouts had them marked at 5 for $4. No need to salt the eggplant before preparing this dish. The roasting dulls any bitterness the eggplant might have had to begin with. 1. Turn oven to 450 degrees Fahrenheit. Line a baking sheet with a silpat or parchment paper; set aside. 2. Place bulgur wheat in a fine mesh sieve and rinse well. Add it to a medium saucepan along with the rest of the ingredients for the bulgur wheat. Turn heat to high and bring to a boil, then cover, reduce and let cook for 15 minutes. At the end of 15 minutes, do not lift lid, turn off heat and allow to rest. 3. Rinse and dry eggplant. Slice in half length-wise. Carefully use a knife to cut down into the eggplant a quarter of the way in from the edge. Work knife around eggplant, taking care not to go all the way through and leaving about ¼ inch of flesh along the bottom of the eggplant as well. Next, beginning at the newly cut outer edge, cut vertical lines through the surface of the eggplant taking care not to go all the way through. Repeat with horizontal lines. This will make it easier to scoop out the flesh. 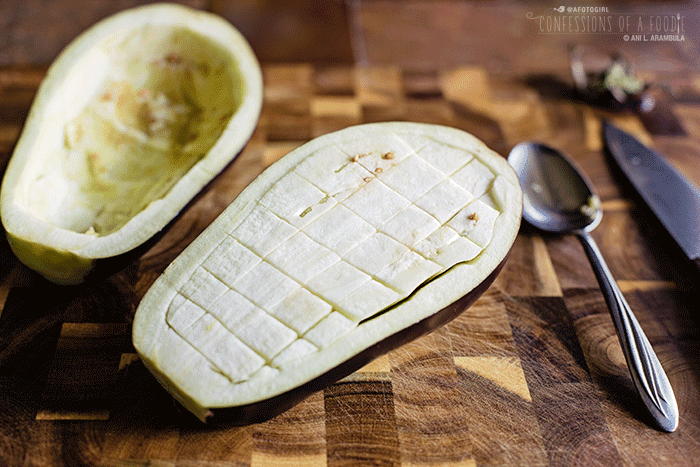 Use a large soup spoon and starting along the edge, carefully scoop out the eggplant flesh into a bowl and set aside. 4. 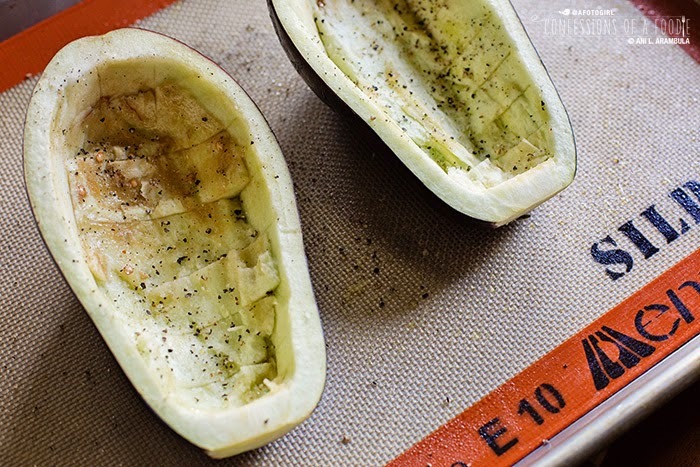 Place the hollowed out eggplant halves onto the prepared baking sheet. Lightly spray with olive oil (or use a pastry brush to cover the surface with olive oil) and sprinkle with salt and pepper. Roast on the middle shelf of the oven for 18 - 20 minutes or until the eggplant is easily pierced with a fork but not mushy. Set aside. 5. Drizzle a large skillet with olive oil and place on medium high heat. When shimmering, sauté the onions until translucent but not browned. Add the eggplant and cook, stirring often, until eggplant is fork tender. Toss in the garbanzos, season with salt and pepper to taste and heat through. Reduce heat to medium-low and add ½ cup of the cooked bulgur wheat, stirring to incorporate (reserve leftover for another use later). 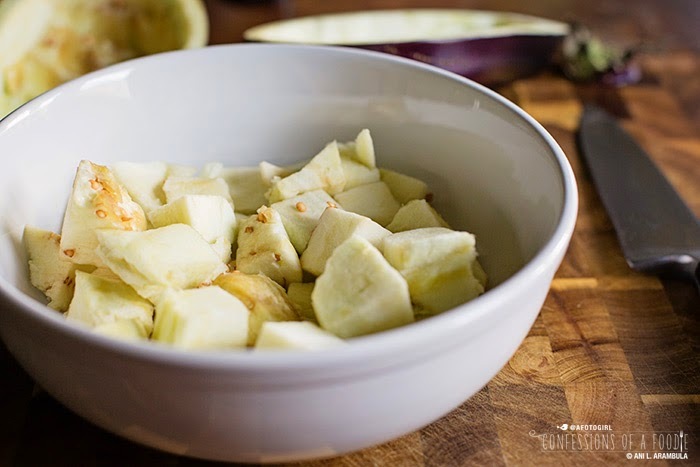 In a small bowl, whisk together the Harissa, lemon juice, ground cloves and water. Add this to the skillet, stirring well to incorporate. Turn off heat and divide the filling between the two eggplant halves, mounding over if needed. 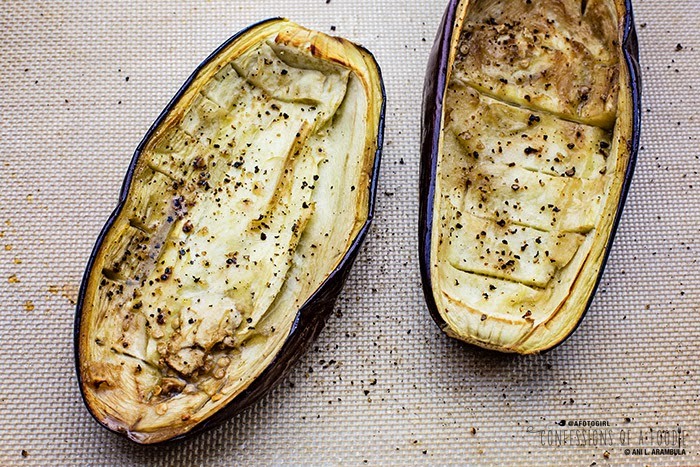 Sprinkle eggplant halves with feta and bake for 10 minutes at 400 degrees Fahrenheit. Remove from oven and allow to rest for 5 minutes before plating. 6. Make the tahini sauce by adding the ingredients to a small bowl and whisking well to incorporate. When ready to serve, place each eggplant half on a plate, drizzle with tahini sauce and top with chopped cilantro. Going to make this, looks fantastic, thanks! Anita bella, I love your pics and choice of dish here. 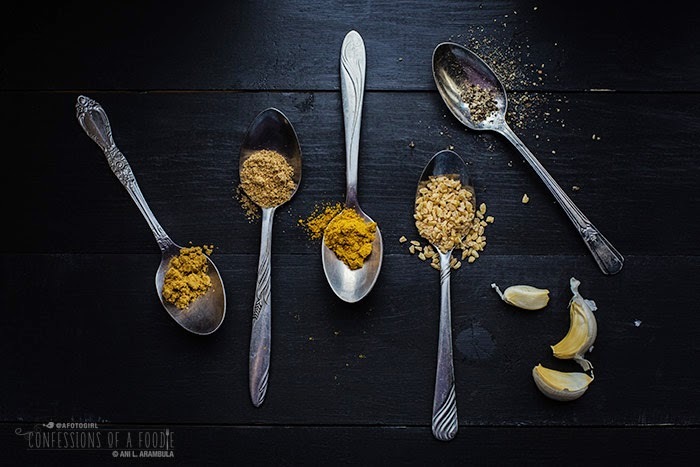 Love the way you present the spices in spoons. Looks delicious. I can't wait to try it! Coco, Thank you! I've made this dish several times now. Love it each time! Hope you like it, too. hugs! Looks absolutely delicious! I love roasting eggplant, it's the best way to serve them. Will try this recipe for sure, thanks! I made this dish for meatless Friday dinner and loved it. Since I love Moroccan cuisine, I had all the ingredients ready (Harissa and Tahini) and all the spices. My kids were suspicious as eggplant does not excite them. I managed to persuade my 9 year old daughter though and she ate a piece. As experts say, offer new foods to your child at least 10times and do not get discouraged if they don't like it first or second time, they will give in eventually. My husband really liked it too and commented that the only thing we are missing is Moroccan music. This recipe is a winner and we will definitely make it again and again. Thank you! Your presentation is clear and professional. Looks amazing! I love aubergine ad this looks like a wonderful entree!